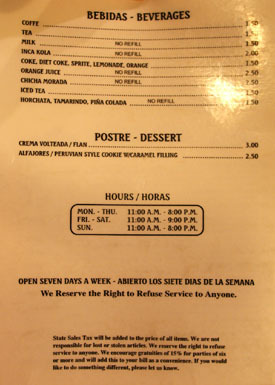 Ever since discovering Mo-Chica, I've been on the lookout for other Peruvian places, especially those that might be a little more conveniently located. Thus, I was pleasantly surprised when I found out about Mario's in La Mirada, an offshoot of the legendary Mario's Peruvian & Seafood on Melrose. 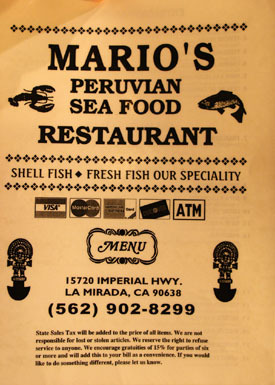 That restaurant, which opened in 1990, is the handiwork of Mario Tamashiro, a Japanese Peruvian originally from Lima (his son, Dennis Tamashiro, is also involved in managing the restaurant). Mario's southern outpost opened in fall of 2007. As aseptic as the interior is, it's still a step up from the church cafeteria-inspired decor of the original location. One peculiar feature is the large "dance floor" separating the kitchen from the dining area. 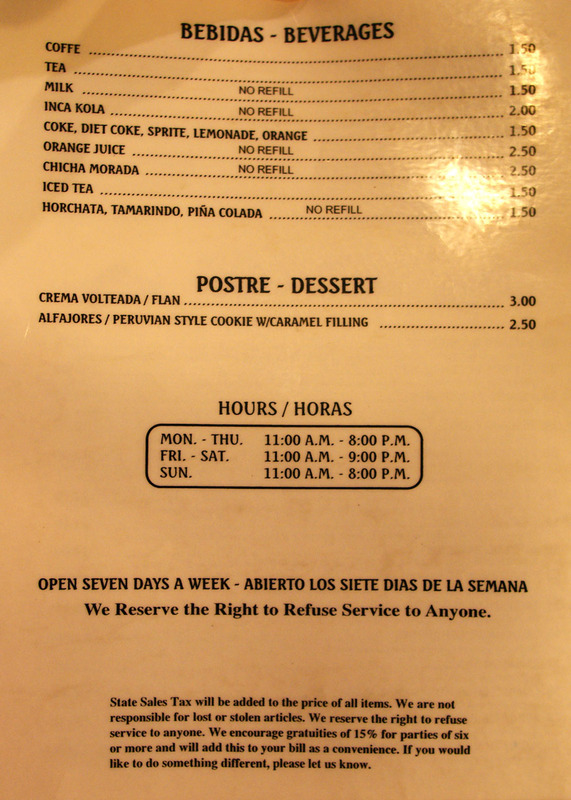 But clearly, we didn't come for the ambiance, but for Mario's menu of Peruvian delights. Though there's "seafood" in the name, methinks that the meat here is at least as good. Click for larger versions. 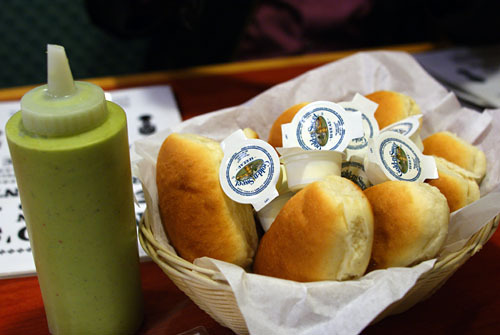 Upon being seated, we were quickly brought a basket of bread, replete with those little cups of butter. Though the loaves were rather institutional-looking, they were also strangely satisfying, especially when eaten warm and with a squirt of that wonderful guac-hued aji (a condiment containing cilantro, garlic, and hot peppers, among other ingredients). 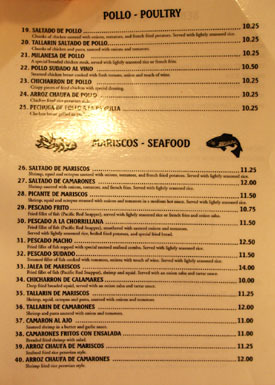 Mario's offers a smattering of beers, the most interesting of which were the two Peruvian selections. 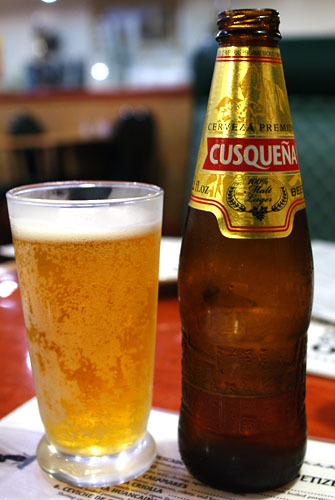 According to our server, the "better" one was the Cervesur's Cusqueña [$5]; it was a typical light lager, and one of my dining companions actually compared it to Bud. 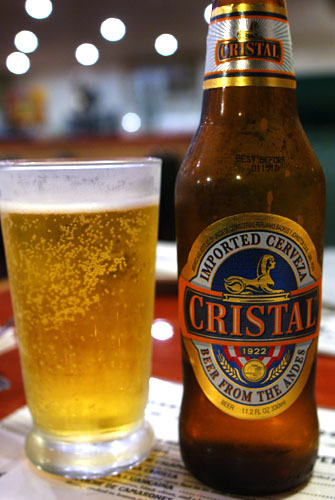 The other cerveza was Cristal [$5], which is brewed by beer monopolist Backus and Johnston (the company also owns Cervesur); this one was also a lager, though more complex, with woody notes over a malty backbone. 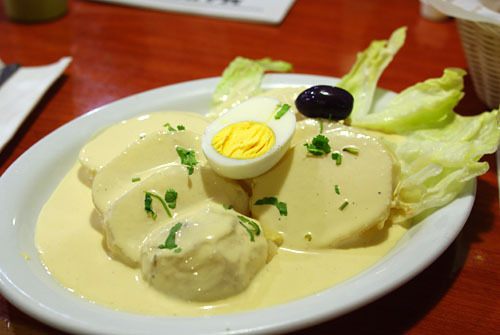 We began with this prototypical Peruvian dish of sliced boiled yellow potatoes (the country is known for its large selection of potatoes), enrobed in a creamy Huancaina (cheese and aji amarillo pepper) sauce, accompanied by lettuce, black olive, and hard-boiled egg. I loved the consistency of the potato, as well as the weight added by the egg, but felt that the sauce could've been richer and more aggressive. A quick squirt of that fantastic aji, however, quickly solved the problem. 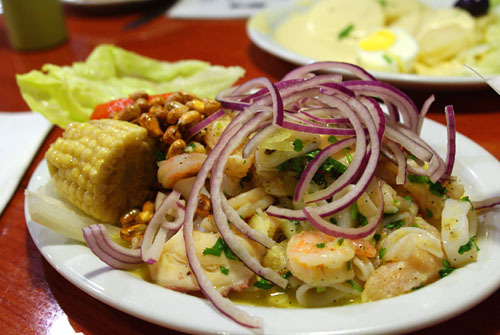 Of course, we had to try at least one form of ceviche, Peru's national dish of seafood (whitefish, shrimp, squid, octopus), marinated and "cooked" in lemon juice, served here with red onion, lettuce, corn, toasted corn (cancha), and sweet potato (camote). Though the fish was a bit tough, the other ingredients were delectable, and I really appreciated the role of the onions and cancha in particular. This was a light, bright, unabashedly acidic jolt to the palate--quite nice. 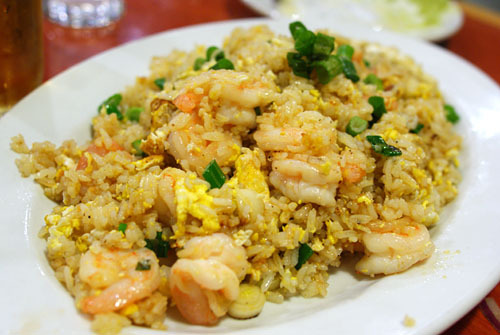 Here, with this shrimp fried rice, we clearly get to see the influence that Asia has had on Peru's cuisine. Upon tasting the dish, we all noted its not-so-subtle Chinese tinge, and appreciated the generous portions of the still subtly briny shrimp mixed in. I actually preferred this to the bulk of fried rices that I've had over the years. 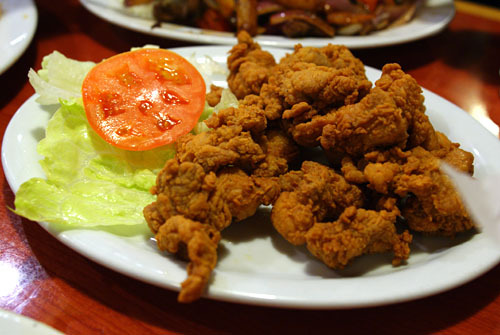 In Latin America, chicharron typically refers to fried pork rinds, though the dish can also be made with chicken meat, as was the case here. It reminded me somewhat of American-style fried chicken, suitably tender and succulent, but with a somewhat darker flavor, and more substantial batter. The chicken was nicely perked up by its bracingly citric dipping sauce, but I preferred to eat it, once again, with that wonderful aji. The Lomo Saltado is a must try at Mario's. It's another Chinese-influenced dish, a stir-fry of marinated beef tenderloin, tomatoes, red onions, and French fried potatoes, all served with a side of rice. I loved the tender, flavorful bits of beef, paired with the vegetables and immensely satisfying slices of potato, all tempered by the mound of fluffy white rice--I even preferred it to Mo-Chica's version. Furthermore, according to Inuyaki, there exists a variation topped with egg called Lomo Montado; I'll have to remember to get that next time. 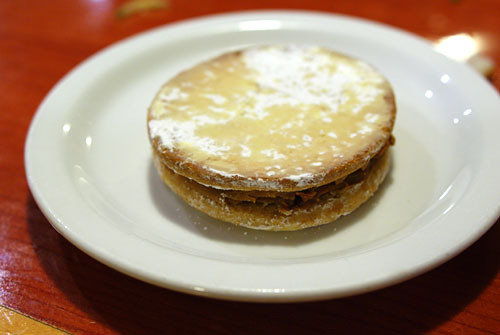 An alfajor is a type of confection made by joining two cookies together with some sort of sweet filling, in this case, a caramel-like dulce de leche. The biscuits themselves, coated with powdered sugar, were appropriately crisp, and went nicely with the subtle, not-too-sugary center. 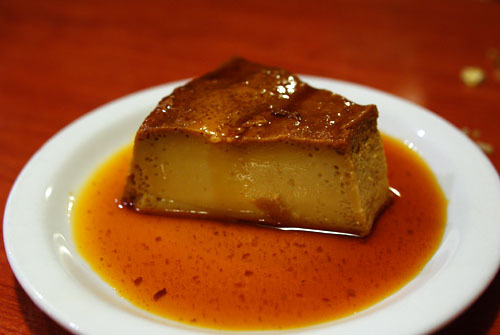 We closed with crema volteada, a flan-esque caramel custard dessert. This version was heavier and denser than usual, with an almost alcoholic tinge, along with a liberal application of dulce de leche. Quite good. Though Mario's may not be the most refined when it comes to Peruvian, I found the food hearty, satisfying, and a great value to boot--it's the type of place that I could see myself coming back to, again and again. Mario's convenient location and easy access truly make it a great place to get your Peruvian fix, without the need to make the trek up North. Wow, I *just* ate at the Melrose location a few hours ago! First time I've ever been. *LOVED* the Lomo Saltado! BTW, I was disappointed to find out they no longer allow you to BYOB/W. And I'm still insanely full. I loved M0-Chica too. Mario's is on the "To Eat" list. Wow, I never knew there was a Mario's in La Mirada! 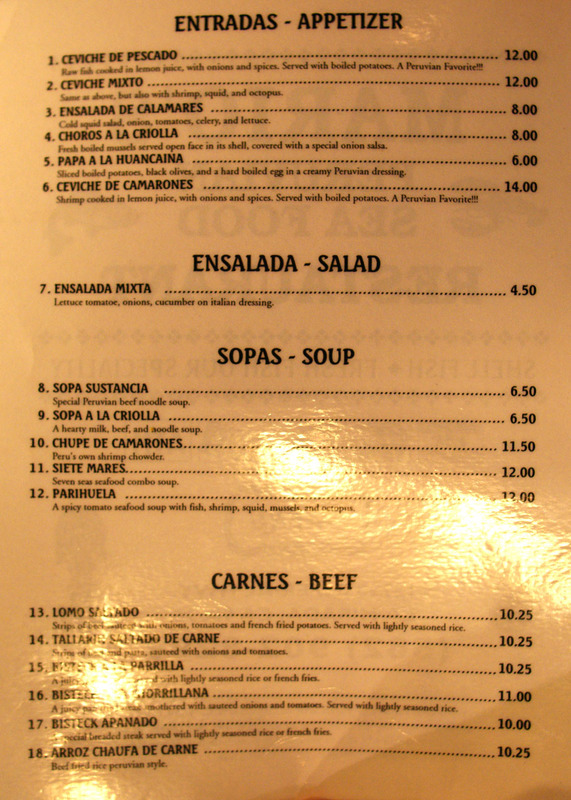 I've been going to the Melrose one for years... and am SO addicted to their lomo saltado. 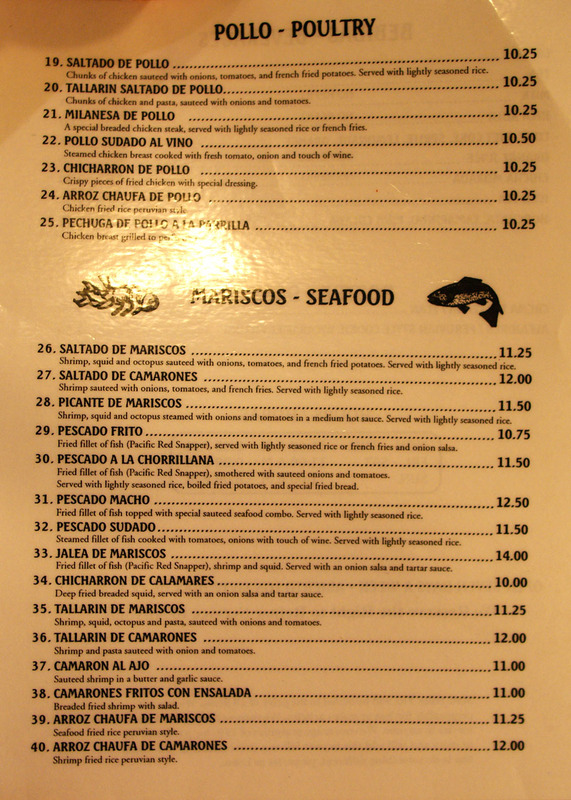 Have you been to los balcones del peru or don felix? I live within 5 minutes of this place and have never been, so I guess I should go now! 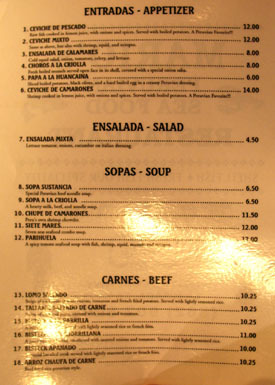 I kinda prefer my Peruvian - like Columbian or Salvadoran - to be a little on the less-refined side, you know? garrrggg!!!! kevin - i see you were in my 'hood again! we gotta eat together again soon - especially at these "affordable" places ;-D great review and pics! Jo: Indeed! Have you been down to this location yet? Jai: What else did you have that was worth trying? So are they not allowing BYOB at all, or are they just charging corkage now? Helen: Haven't been to those yet. How would you rank them compared to Mario's? Josh: Let us know how it turns out! PP: I see where you're comin' from. I think that there's a place for both styles. Jane: Yes we do--let me know when! YUM! Anything with the word "Chicharron" is good eats. BTW, it seems elBulli rejection letters went out this morning. Of course I didn't make the top 8,000. There's always next year. No more BYOB. The Lomo Saltado was easily the favorite of the night. I've only been to their Hollywood location and while I loved the flavor of the lomo saltado and the rice, my meat was a bit tough - seafood saltado (marisco saltado?) was much better that night. Seems like you guys had a much more tender version, though. 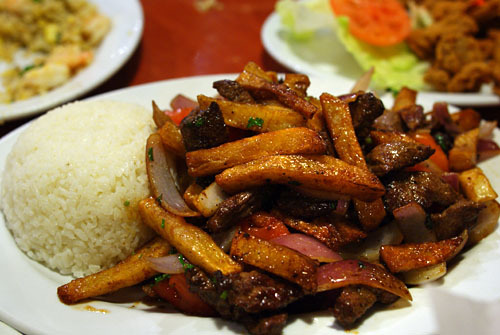 I'd love to try it again since I've been hooked on lomo saltado ever since I went to Peru. Jocelyn: I haven't heard anything from elBulli. Is that a good sign then??? Jai: What was the reason behind the change? Do they at least offer a decent selection of booze?